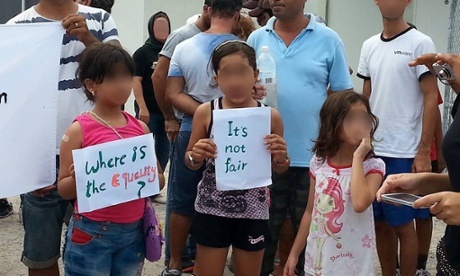 Families in the Nauru detention centre protest against Australia’s new deal to resettle refugees in Cambodia. The Australian immigration minister, Scott Morrison, has signed a memorandum of understanding in Phnom Penh that cements a plan for refugees who sought Australia’s protection to be ultimately resettled in Cambodia instead. But refugees on Nauru have staged protests saying they will all refuse to move to Cambodia in what they describe as a “cruel deal” that will keep them in detention forever. In an opulent function room under a blazing chandelier, Morrison and Cambodia’s interior minister, Sar Kheng, signed the necessary documents without saying a word, the silence interrupted only by the sound of smashing glass – as a waiter tripped over – and questions shouted out from a phalanx of journalists gathered behind a gold rope. 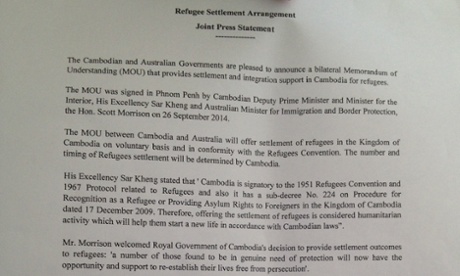 Scott Morrison signs the refugee resettlement deal with Cambodia on Friday. A joint statement released after Morrison sped off in a car said: “Under this MOU, Australia will use its expertise and experience to assist Cambodia to strengthen settlement support provided to refugees in Cambodia. After Australia’s immigration minister, Scott Morrison, signed the deal with Cambodia in silence the waiting media was handed this statement. 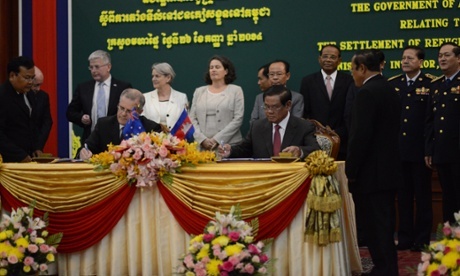 “As part of this commitment, Australia will bear the direct costs of the arrangement, including initial support to refugees, and relevant capacity building for Cambodia to ensure it has the appropriate resources to receive and integrate the refugees successfully.” It said the deal did not breach the refugee convention. Over the course of the past few days news of the mostly secretive agreement – which was proposed by the foreign minister, Julie Bishop, in February – and which Cambodian foreign ministry officials this week confirmed would be signed on Friday – has been met with condemnation and dismay from human rights and refugee advocacy groups. The statement released after the signing said the two countries would work with the UN high commissioner for refugees (UNHCR) to implement the deal. But the UNHCR condemned the deal, expressing deep concern at the precedent it sets. António Guterres said he hoped Australia would reconsider. “We are seeing record forced displacement globally, with 87% of refugees now being hosted in developing countries,” Guterres said. “It’s crucial that countries do not shift their refugee responsibilities elsewhere. Morrison has said Australia plans to give a further $ 40m to Cambodia over the next four years, but insists that this is for development projects and is not in exchange for the refugees. Protesters thronged behind a barricade outside the Australian embassy in Phnom Penh on Friday morning before the signing ceremony, which was held at the interior ministry in the presence of journalists and officials from both governments. The protesters argued that Cambodia – where gleaming Range Rovers co-exist alongside scenes of grinding poverty – is simply ill-equipped to accept refugees, particularly when its own human rights record has been so heavily scrutinised, its public health service is substandard and its courts are mired in corruption. In a statement, the Australian Council for International Development referred to the MOU as an “unnecessarily cruel” policy. “Refugees being sent to Cambodia are being set up to fail in a poor country,” it quoted the executive director, Marc Purcell, as saying. “Our aid money should not be used to sweeten the deal with one of our poorest neighbours. The government’s stated objectives for international aid are economic development and human development and this just looks like an inducement to take refugees off Australia’s hands,” he added. Refugees on Nauru say they will not accept the offer of resettlement in Cambodia. Refugees on Nauru say they will all refuse to move to Cambodia and have staged protests against what they say is a “cruel deal” that will keep them in detention forever. A refugee in a Nauru camp told the Guardian on Friday all those found to be refugees were united in their opposition to being sent to Cambodia. Protests began on the island Thursday night after refugees and asylum seekers were shown a video – featuring Morrison – telling them the reintroduction of temporary protection visas would not apply to them. The refugees on Nauru have been found by Australia to have a ‘well-founded fear’ of persecution if they are sent home. It is illegal for Australia to forcibly send them back to their country of origin. Refugees said the protests were peaceful, but that some had demanded the locked gates be opened so they could protest outside. Police arrested several demonstrators. It is unclear how many. The protests continued on Friday in the children and family camp. 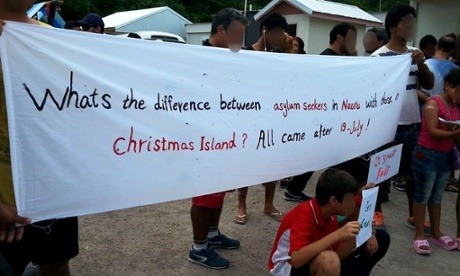 Men held a banner saying “what’s the difference between asylum seekers in Nauru with those on Christmas Island?” Children carried signs that read “it’s cruel”, and “it’s not fair.” Officials from the immigration department who visited camps were shouted at and told to leave. The UN refugee agency said that as at 31 August there was a total of 1,084 people on Manus Island and 1,233 people in Nauru. Cambodia currently hosts 70 refugees and 20 asylum-seekers.